Menton is getting busy. Book a hotel now! Just a few kilometres from the Italian border, Menton is known for being a sunny spot to spend your waning years. It's considered the warmest spot on the French Riviera which helps explain its luxuriant vegetation and the lemon trees that have become a kind of town symbol. Indeed, the best time to visit Menton is during the Fete de Citron (Lemon Festival) that occurs each year around Mardi Gras. Although the settlement of Menton dates far back to prehistory, little is known until Charles Grimaldi of Monaco bought the town in 1346. Menton swung from the Grimaldis to the Duke of Savoy to the Duc of Milan to Spanish rule before eventually becoming attached to France in 1860. Once the English discovered the Cote d'Azur at the end of the 19th century, Menton and its mild climate began attracting European aristocracy and then, inevitably, artistic types. . The writers Guy de Maupassant, Robert Louis Stevenson, Gustave Flaubert, Emile Zola and KatherineMansfield found Menton a congenial place to relax and write. Menton is still a relaxing place. Its residents are mostly senior citizens and its visitors often come from nearby Italy. The main activity in Menton is to stroll around enjoying the attractiveness of your surroundings. The medieval Old Town is a meandering network of stone streets that eventually leads to the Basilique Saint-Michel, a magnificent example of baroque architecture. Continue on to the Cemetery which affords a lovely view of the region. Another nice walk is along the beach and the Old Port. Southwest of the Old Port is the Jean-Cocteau Museum, dedicated to the artist who lived in Menton from 1956 to 1958. Another worthwhile museum is the Fine Arts Museum (Musée des Beaux-Arts) located in a 17th-century palace. And don't miss the gardens of Menton; there are a half dozen gardens to explore ranging from exotic species to flowering plants to cactuses. 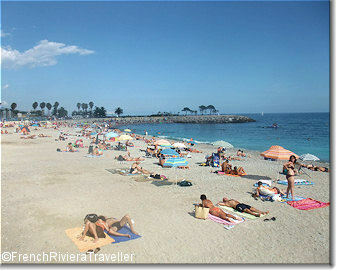 The long, narrow stretch of coast south of the Old Port is a rocky beach bordered by the pleasant Promenade de Soleil. North of the Old Port is the Les Sablettes beach which is sandy and great for kids. Both beaches have lifeguards in the summer. See more about Menton beaches. Menton is on the regional train line that runs from Nice to Ventimiglia. See more about trains on the French Riviera. The regional bus line, RCA (Rapides Cote d'Azur) links Menton with Nice, Nice Airport and Monaco. See more about buses on the French Riviera. Menton has a small but efficient bus network. 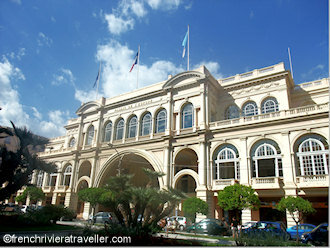 The Menton tourist office is in the Palais de l'Europe.